We are an authorized dealer for Hoston machine tools, Click on the Icon to the left or the link below to view their Vertical Mills. Contact us for options and current pricing. We are an authorized dealer for Baileigh Industrial, Click on the Icon to the left or the link below to view their Vertical Mills. Contact us for options and current pricing. Bridgeport Series I - 9" x 42"
S# 75452, 9" x 42" Table, 8 Spindle speeds from 80 to 2720 rpm, Spindle takes R-8 collets, Fwd/rev on spindle, Adjustable depth stop from 0 to 5", Bridgeport power cross feed w/ 14 feed ranges from 9/16" to 9 3/16", Cleaned & painted, 1hp 208-220/440v 3ph, Overall Dim. 4' 8"L x 5' 3"W x 6' 6"H, Est. Wt. 1,800 lbs. Bridgeport Series I - 9" x 36"
S# 147675, 9" x 36" Table, SWI Trak 102 X/Y DRO, Dial in spindle speeds from 60 to 4,200 rpm, Spindle takes R-8 collets, Power down feed, 0" to 5" Adjustable depth stop, Bridgeport power cross feed, Dial in feed from 0.75 to 35 w/ rapid traverse, Adjustable stops, One shot lube system, 1.5hp 230/460v 3ph, Overall Dim. 4' 6"W x 5'L x 7'H, Est. Wt. 1,800 lbs. S# 172677, Tech DROII-2M X/Y DRO, Dial in spindle speeds from 60 to 4,200 rpm, 0" to 5" Adjustable depth stop, Power cross feed, Hi/low start/stop controls on knee, Chromed ways on knee, Built in coolant, One shot lube system, 1.5hp 230/460v 3ph, Cleaned & painted, 5'L x 5'W x 6' 10"H, Est. Wt. 1,800 lbs. S# 146596, 9" x 42" Table, Bridgeport power cross feed, Dial in spindle speeds from 60 to 4,200 rpm, Spindle takes R-8 collets, 0" to 5" Adjustable depth stop, Magnescale X/Y programmable DRO, 1.5hp 230/460v 3ph (wired 230v), Cleaned & painted, Overall Dim. 5'L x 5'W x 6' 10"H, Est. Wt. 1,800 lbs. Bridgeport Series I - 9" x 48"
S# 238173, 9" x 48" Table, Bridgeport power cross feed, Dial in spindle speeds from 60 to 4,200 rpm, Spindle takes R-8 collets, 0" to 6" Adjustable depth stop, Acu-Rite X/Y programmable DRO, Bijur one shot lube system, 2hp 220/230/440v 3ph (wired 230v), Cleaned & painted, Overall Dim. 4' 8"L x 5' 7"W x 7'H, Est. Wt. 1,800 lbs. Bridgeport Series II Special - 11" x 58"
S# 4051S, 11" x 58" Table, Variable speed spindle from 60 to 3,500 rpm, Sony X/Y programmable DRO, Torque-Rite power draw bar, Bijur one shot lube system, Air assist on knee, Chromed ways on knee, 1/10hp Coolant pump w/ external tank, Spindle motor 2hp 220/440v 3ph, Overall Dim 5' 5"L x 7'W x 7' 10"H (on 3"H wood blocks), Est. Wt. 5,500 lbs. Cincinnati Cinel 60 DH Universal Mill - 12" x 60"
Model No. DH, Type Cinel, Size 205-12, S# 31032 U5 W-0007, Date Mfg. July 1970, 12" x 60" Table, Swivels R/L 45°, 8.5" Vise, Adjustable stops, Powered X/Y/Z, Vert./Horiz. spindle 50 taper, 8 Vertical spindle speeds from 100 to 1,530 rpm, Horizontal spindle speeds from 25 to 1,500 rpm, Dial in feed adjustment, Main drive 10hp 440v 3ph 60cyc (110v control), Feed motor 3hp, Pump motor 1/4hp, Overall Dim. 7' 6"L x 6' 7"W x 7' 2"H, Est. Wt. 8,550 lbs. Cincinnati Milacron Cinova 80 DH Vertical Mill - 14" x 62"
Model No. 80 DH, S# 31423V73-0009, 14" x 62" Table w/ adjustable cross stops, Powered X/Y/Z, 16 Spindle speeds from 25 to 2,000 rpm, Spindle taper No. 50, Power down feed, 4 Adjustable depth stops, In/out & up/down adjustable stops on knee, Built in coolant 1/10hp pump, 2hp 230/460v 3ph 60hz, Overall Dim. 5' 10"L x 6' 4"W x 6' 6"H, Est. Wt. 5,000 lbs. Clausing Kondia FV-1 Vertical Mill - 9" x 48"
Clausing Kondia CNC Vertical Mill - 11" x 58"
Clausing Kondia FV-300 CNC Vertical Mill - 11" x 58"
Vertical head model VH 2, S# 25629, 1 1/16" Collet capacity, 8 Spindle speeds from 110 to 1,850 rpm, 6.5" x 25" Table (swivels 0° to 40°), Left/right power feed on table, Adjustable work light, Built in chip catch pan, 3/4hp 440v 3ph, Overall Dim. 3'W x 3' 8"FB x 5'H, Est. Wt. 900 lbs. Jet JTM-4VS Vertical Mill - 9" x 49"
Model JTM-4VS, S# 201505455, 9" x 49" Table w/ adjustable stops, Jet power cross feed, 5" Depth stop, Spindle takes R-8 collets, Dial in spindle speeds from 60 to 4,200 rpm, Power feeds .003"/.0015"/.006", Coolant system in base, One shot lube system, Chrome ways on knee, 3hp 230/460v 3ph, Overall Dim. 6'L x 5' 6"W x 7'H, Est. Wt. 1,800 lbs. 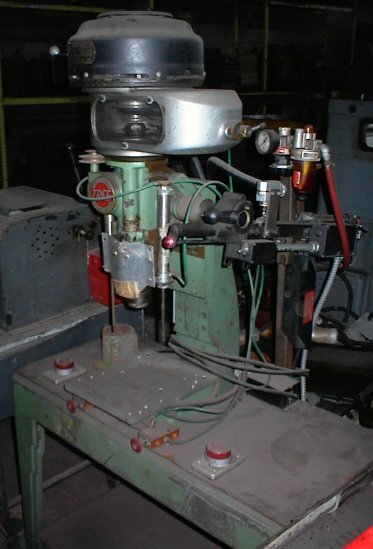 Lagun FTV-2S Vertical Mill - 10" x 50"
Model FTV-2S, SE 23809, 10" x 50" Table, Spindle speeds from 60 to 4,200 rpm, Takes R-8 collets, 5" Depth gauge, One shot lube system, Hard chrome ways, 2.2kw 220/440v 3ph, Cleaned & painted, Overall Dim. 5' 7"W x 5' 1"L x 7' 4"H, Est. Wt. 2,000 lbs. Lux Vertical/Horizontal Universal Mill - 10" x 47"
Manford SP-150VSL Vertical Mill - 9" x 48"
Model SP-150VSL, Date Mfg. 2002, 9" x 48" Table, Variable speed spindle from 500 to 4,500 rpm, Spindle takes R-8 collets, 5" Depth stop, Anilam Wizard 211 X/Y Programmable DRO on swing arm, Super Power AL-500S cross feed, Built in coolant 1/10hp motor, One shot lube system, Spindle motor 3hp 220v 3ph, Overall Dim. 5' 6"W x 4' 9"L x 7' 7"H, Est. Wt. 2,500 lbs. NASA III Vertical CNC Mill - 13" x 42"
Sharp-KF Combo Vertical/Horizontal Milling Machine - 9" x 44"
Model KVH, S# 5413, Hour meter with 1,576 hrs., 9" x 44" Table, 8 Vertical spindle speeds via step pulley from 210 to 3,440 rpm, 5" Depth gauge, 6 Horizontal spindle speeds from 50 to 1,180 rpm, Fwd/Rev on both horizontal & vertical spindles, Table feed rates 7/8" - 1 7/8" - 3" - 4 3/8" - 9 3/8" - 15" per minute, 2hp 480v 3ph, Overall Dim. 4' 9"L x 4' 9"W x 7' 3"H, Est. Wt. 2,850 lbs.